The system, which will be installed at a municipal clinic called Salud y Bienestar Municipal Direccion in <?xml:namespace prefix = st1 ns = "urn:schemas-microsoft-com:office:smarttags" />Guatemala City, consists of a Sedecal X-ray system (known as the WHIS-RAD) that is compliant with specifications set out by the Pan American Health Organization (PAHO) and the World Health Organization (WHO). 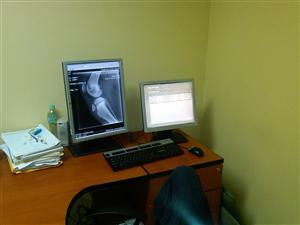 The digital component of the WHIS-RAD consists of a Carestream Computed Radiography (CR), a Hewlett-Packard work station, server and multiple viewing stations, Merge PACS software, and internet connectivity. The digital components were selected to ensure the simplicity and utility of the system. Computed Radiography technology employs a CR plate and plate reader to provide a digital image. The plate is placed in a standard cassette holder in the X-ray system in place of film. The materials in the plate are highly sensitive to X-rays and “store” the energy of the X-ray image. The plate reader is a laser line scanner which scans the plate and then returns the plate to its pre-exposure state – it “erases “the X-ray image so that the plate can be used repeatedly. Next, the stored image is sent to the server which supports the workstation and viewing stations that are located in the physicians’ work areas. Internet connectivity enables images to be sent to local, off-site radiologists who can consult with the physicians at the clinic. Internet connectivity also enables electronic storage and retrieval from massive databases structured to service multiple locations. This system eliminates the need for film and chemicals, a dark room, and film processing equipment. It provides virtually immediate access to the images while the patient is still in the clinic and provides for expert consultation by radiologists, wherever they may be located, thereby overcoming the absence of radiologists in remote locations. Individual patient images can be provided to each patient in the form of CDs or flash drives. This imaging system can be used to help diagnose trauma injuries, lung disease, including tuberculosis, heart disease, and a host of other medical conditions. Fractured limbs can be set properly and disease diagnosed more accurately, quickly, and earlier with the availability of this health care technology. Furthermore, health data entered into the system may be de-identified and used by public health departments to understand and track disease trends throughout the community and region. The pilot site in Guatemala City will provide an easily accessible location to research and develop diagnostic imaging solutions for the developing world and a basis for replicating this technology in multiple sites within Guatemala and elsewhere. This system is being provided by the World Health Imaging, Telemedicine, and Informatics Alliance (WHITIA) a not-for-profit corporation founded by Rotarians from Rotary Districts 6440 and 6450, Northwestern University, and suppliers of diagnostic imaging equipment, software, and services. WHITIA is modeled after a Northwestern model that suggests that developing countries can best be served through non-profit consortiums of academia, industry, and philanthropy. District 6440 clubs that participated in funding the installation include Arlington Heights Sunrise, Des Plaines, Evanston, Mundelein-Vernon Hills, Mt. Prospect Sunrise, and Park Ridge.